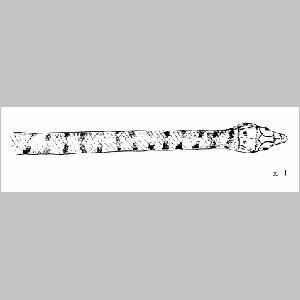 A long, thin, non-poisonous snake that is very variable in color and pattern, probably to match habitat. A lightish gray or fawn background with dark brown transverse stripes across the back. On the sides are more blotches of the same color as the stripes, but not joined to them. The underside is white. The eye pupils are round and black. There is a small white line in front of and behind the eye. In Arabia it is mainly confined to the mountain regions of the west and south, plus the UAE and Oman, though it ranges from northeast Africa to Pakistan. It is frequently found in wadis, particularly where water is present and swims well, sliding with ease into and out of crevices and under pebbles. It can climb fairly steep rock faces. This snake lives on a diet of small mammals, lizards and fish. It is essentially a diurnal creature and in warm conditions moves, as its English name suggests, extremely fast when frightened. In cooler weather this snake is not too difficult to catch and rarely attempts to bite. C. rhodorhachis has been captured in Wadi Fay near Hatta and at Khatwah / Mahdah in Oman (just beyond Buraimi). It has been photographed by ENHG members in a wadi near Hatta (P. Denmead) and in Wadi Jeema, Hata (R. Western, late March 1987). It has also been recorded in a wadi near Ghayl in Ras al Khaimah, and in Wadi Uyaynah near Dibba. There is a specimen in the Group’s collection. Typical measurements are 61 cms. long by 1cm. across at the broadest. Ref: Personal communication – Dr. E.N. Arnold, Dept. of Zoology, British Museum (Natural History), Cromwell Rd., London SW7 5BD.